The acceptable temperature range for server conditions changes over time, as industry authorities incorporate hardware and cooling innovations as well as new empirical data for equipment functionality into new recommendations. The American Society of Heating, Refrigerating and Air-Conditioning Engineers bumped up the inlet air temperature limit to 80 degrees Fahrenheit, which can yield significant energy savings. However, this change will increase hot aisle temperatures up to 100 degrees Fahrenheit , requiring the use of efficient rear door cooling units, according to TechTarget contributor Robert McFarlane. New equipment could soon allow inlet temperatures up to 104 degrees Fahrenheit, increasing the potential for more overhead savings but also creating hardware performance risks. Power management is crucial to ensuring equipment operates at peak performance and that environmental control systems are actively keeping the facility stable. Datacenter Dynamics contributor Nick Booth noted that operators need to handle resources skillfully by ramping up resource usage in order to manage any sudden variations in computing demand. Power management strategies enable operators to add or remove uninterruptible power supply units on an as-needed basis. This way, facility management ensure that all units in use are operating at full capacity, maximizing energy usage and ensuring that the power stays on. "With everything else, there are degrees of failure," Virtus Data Centres' operations director Dave Watkins told the source. "With power, the outcomes have a dramatic polarity. It is either on or it's off – and if it's off it's game over." Optimal temperature and humidity levels are needed to ensure the viability the equipment.. Humidity monitoring has taken off due to rising humidity in data center environments. Humidity and temperature outside of the recommended ranges can create havoc in the data center, affecting performance conditions. Because most high-density facilities can vary in temperature, the recommended 45 percent to 50 percent relative humidity becomes meaningless, McFarlane noted. However, dew point is easier to define and manage. "Dew point temperature, on the other hand, is essentially the same throughout the room, therefore a more reliable metric to regulate humidity," McFarlane wrote. "And since so many source-of-heat cooling devices provide no humidity control but must maintain cooling above the dew point to avoid condensation, DP control is really the only way to go." 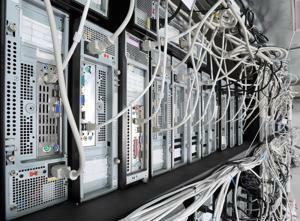 Managing data center operations has become a considerable challenge as more regulations are placed on energy usage. However, by using emerging efficiency solutions like temperature and power monitoring, organizations can better control facility environments and realize conservation benefits.